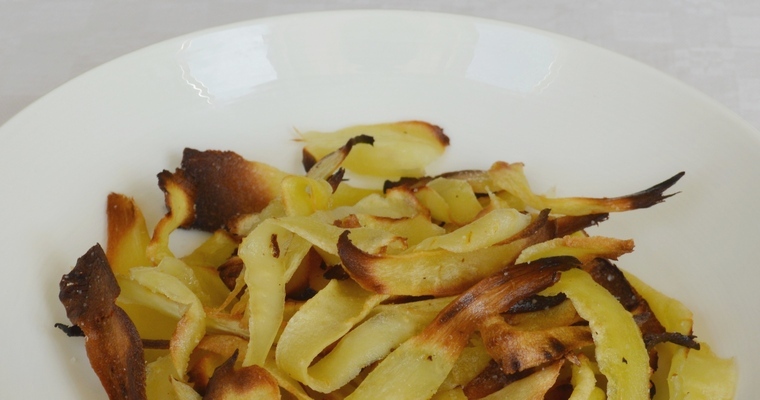 Thin strips of parsnip are baked in the oven to crisp, golden shards. The salty-sweet combination makes a deliciously moreish alternative to potato crisps. These crisps make a great standalone snack, but I like to serve them with soup as an alternative to bread. The first trick to a crisp texture is to make sure you don’t overcrowd the roasting tray, as this causes the parsnip ribbons to steam rather than roast. The second trick is to resist the natural temptation to snaffle them as soon as they are out of the oven. They will continue to crisp up as they dry, so it is worth waiting 30 minutes before serving. Preheat the oven to 180°C/355°F. Place a large metal roasting tray in the oven to warm up. Trim the ends of the parsnips and discard. Peel and discard the skin. Peel the flesh of the parsnip into ribbons using a swivel peeler (run the peeler lengthways down the parsnip, rotate the parsnip 90 degrees, and repeat until you reach the woody core). Place the ribbons in a bowl and discard the core. Pour the cooking oil into the bowl and use your hands to toss until the parsnip ribbons are evenly coated in oil. Remove the preheated tray from the oven and brush with a teaspoon of cooking oil. This will stop the crisps from sticking to the tray. Arrange the ribbons in a single layer on the roasting tray, giving them plenty of room to roast and crisp up – use two trays if necessary. Transfer to the lowest shelf of the oven, where it is coolest. Cook for 15-20 minutes, until crisp and starting to brown at the edges. Turn the tray halfway through for even colouring. There is a fine line between crisp and burnt, so watch carefully toward the end of the cooking time! Once cooked, line a tray with paper towels. Transfer the parsnip crisps to the tray using a fish slice. Sprinkle over the salt, then use your hands to toss until evenly coated. Arrange in a single layer so they have room to dry. Leave for 30 minutes before serving, as they will continue to crisp up while cooling. Best eaten within 2 hours, although leftovers can be stored in an airtight container, out of the refrigerator.